Around 2 and half years ago I started to hear news surrounding a small indie game development team called Mojang from Sweden. The concept of the game sprung out at me, imagine Lego + sandbox video game. This game was going to allow me to build structures just like Lego did and also let me create and tell my own story. Already Minecraft was starting to sink its teeth into me and had no intention of letting go. Minecraft is a sandbox game, when you are first dropped into its “blocky” world your first task is to find/build shelter. With no materials to hand you have to gather wood by running up to trees and punching them until its drops a block. This block can be picked up by the player and then crafted into tools, say an axe. Use the axe to then gather more wood quickly and then you can create more tools such as a spade, pickaxe or a sword. This all sounds quite surreal, so just below is a video of me playing the first 20 minutes. Minecraft has come a long way since I first started playing its early Alpha/Beta stages. Hundreds of new features have been added over the years to keep the game fresh and appealing. This is why I have a love for Minecraft and its eager and committed community. Updates for the game arrive every month which include new features and bug fixing. The community is always growing and with over 9 million copies of the game sold to date and it looks like it’s not stopping anytime soon. As Minecraft got bigger and bigger more people started to look at what it had to offer. As part of the Redbridge Games Network, I was interested to see how Minecraft could play a part in the classroom. Just over a year ago I stumbled across Joel Levin better known as MinecraftTeacher on Twitter and Tumblr. He began his own Minecraft club at his school in New York. I started looking at the work he and his pupils were creating and instantly I wanted to follow in his footsteps. His idea was to create a self-built community by the children whilst looking at different aspects of learning. They were covering Literacy, Numeracy, PSHCE (Citizenship) and even Design and Technology. In September 2011 I started my first Minecraft club; it was aimed at low achieving boys in year 4. It was going to be a creative writing club. I had 8 boys in the club and we started to play Minecraft together. I had bought 4 Minecraft accounts so we could all play on the same server (one account per pair) and play together in the same world. I had already edited this world so when the game started we all began on a beach with a sunken ship just off the coast. I told them they were all miners travelling to South America by boat when they had been hit by a storm and woken up on this island. What should we do? Where should we go? What are our priorities? Over the course of the 6 week unit we created Wordles, diary accounts and audio logs of our time on the island. They had all really enjoyed the experience and word spread around the school that I was using Minecraft in lessons. Some excellent work was produced and I have posted some of this in the post. As word spread of Minecraft club more and more pupils wanted to join. 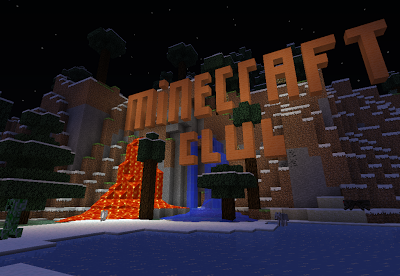 I decided to change the clubs name to Creative Worlds in January 2012 and took the club in a different direction. My aim was to take children from years 4, 5 and 6 who didn’t really know each other and create a community around Minecraft. The club was more about working together and building cohesion between the pupils who had never really spoken to each other before in school. I was going to be blogging about this club but I just never got around to recording all the wonderful things the pupils had created. I have a few of the worlds saved and it was amazing to watch their world come to life with more buildings, shops, swimming pools and rocket ships. Starting this week I have new club of 16 children and together we are going to write about our experiences once a week. The children will be contributing to the posts and explain what they are getting from using Minecraft in the classroom. In these blog posts I will be going into more detail about how to set-up servers and creating multiplayer games. I will also talk about how to use the excellent tool from Minecraftedu which allows the teacher full control of the world and the players to give the lesson more focus when needed. I’m very excited to start a new journey in Minecraft, it is a brilliant multi-purpose learning tool and I hope to show what it has to offer over the coming weeks. LINK Ideas Channel- Is Minecraft the Ultimate Educational Tool?